Today at Research In Motion’s annual BlackBerry Developer Conference, CEO Mike Lazaridis announced the company’s new tablet — the PlayBook. 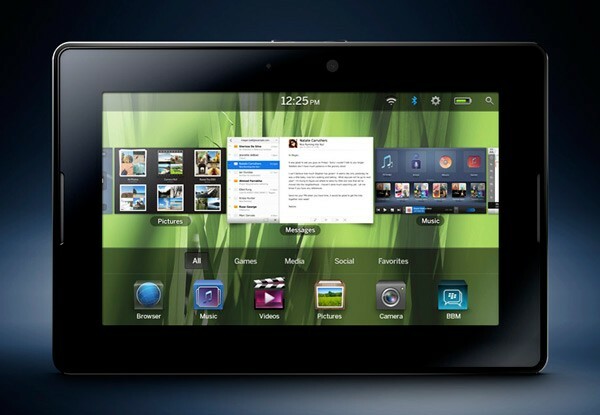 The tablet will utilize an OS created by the recently acquired QNX (just as we’d heard previous to the announcement) called the BlackBerry Tablet OS which will offer full OpenGL and POSIX support alongside web standards such as HTML5 (which is all tied into RIM’s new WebWorks SDK). Lazaridis was joined on stage by the company’s founder, Dan Dodge, who said that “QNX is going to enable things that you have never seen before,” and added that the PlayBook would be “an incredible gaming platform for publishers and the players.” RIM also touted the PlayBook’s ability to handle Flash content via Flash 10.1, as well as Adobe AIR apps. The new slate — which Lazaridis described as “the first professional tablet” — will sport a 7-inch, 1024 x 600, capacitive multitouch display, a Cortex A9-based, dual-core 1GHz CPU (the company calls it the “fastest tablet ever”), 1GB of RAM, and a 3 megapixel front-facing camera along with a 5 megapixel rear lens (and yes, there will be video conferencing). There was no mention of onboard storage capacity during the keynote, though the devices we just spied in our eyes-on post are labeled 16GB and 32GB on their back panels. The PlayBook will be capable of 1080p HD video, and comes equipped with an HDMI port as well as a microUSB jack, 802.11a/b/g/n WiFi, and Bluetooth 2.1. The device clocks in at a svelte 5.1- by 7.6-inches, is only 0.4-inches thick, and weighs just 400g (or about 0.9 pounds). It will from the begining have kindle on it’s “app store”! so readiung is not an issue. It even has multi tasking! but is it that good? Next: Want a batmobile? There's one for sale right now!